In our previous article we discussed how 2017 has been an exciting year for digital marketing with a focus on key trends impacting your online presence in 2018. The next step is to start planning your budget for the coming year. Businesses need to decide how much to spend on digital marketing, which channels to optimize, and where to make investments in new technology while keeping up with the budget allocated for the financial year. Most businesses don’t have an adequate budget to fully invest in all aspects of digital marketing. There is an ongoing struggle to optimize the spend between the practical reality of running a business and a wide array of marketing options. The ultimate goal is to deliver the right content to the right user at the right time. Utilizing the steps to achieve that goal will help you allocate your digital marketing budget most effectively. Are you trying to drive more revenue? Do you care mostly about customer acquisitions? Do you wish to maintain or grow your brand? Are you interested in building brand loyalists? Depending on your goals, the strategy you implement and technology you deploy may differ. Once your goals are decided you need to map these to tactics to accomplish those goals. What search engines might be best to reach your audience? What kind of display advertising do you need and which network might be most beneficial? Which social networks are most relevant for your business? Are there 3rd party channels such as online travel sites (OTA’s) and meta search engines that you should consider? Which customer review channels are important for your business – Yelp, TripAdvisor, Citysearch, Google Places or others? Once your goals and objectives are defined and supported by relevant strategies, KPI’s and channels, inventory your existing digital assets starting with your website. 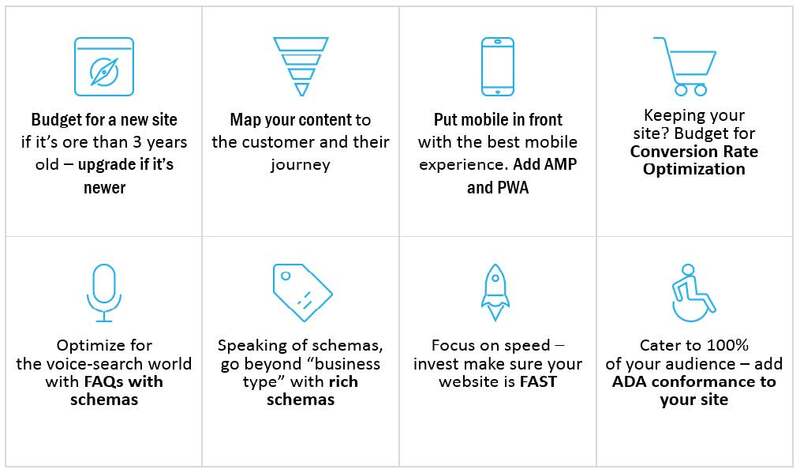 Then look at your content strategy and map it to your end users’ needs. To do that, consider the customer intent and personalize their experience. Users desire different types of content depending on where they are at in their journey. For example, the content needs at the awareness stage are totally different for someone who might be at the conversion stage. At the awareness stage, the consumer might want to know more about what kind of activities are available at a destination, compared to someone at the conversion stage, who wants to know specific terms and conditions to close their transaction. It’s also critical to know your audience. Who is your website target? Are they predominantly male or female? What interests do they have? Are they movie lovers, or perhaps they like shopping or maybe they like the outdoors. Understand the makeup of the audience you are trying to target. Once you understand your audience demographics, you need to map that to personas. What does your typical consumer look like? What are their preferences? What are they seeking in their experience with your business? Are they adventurous or do they just want to relax? 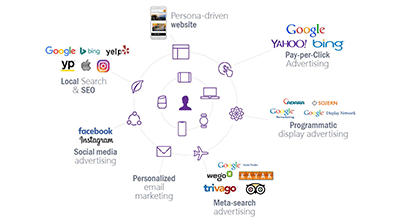 Finally, align digital assets to your goals and targeted personas. Think about the stages of the customer journey – what kind of content does your targeted persona need to move through the customer journey to the goal? It’s important to keep in mind that you might have to saturate all your available channels to serve your audience and different personas. Refresh your website: If you haven’t refreshed your site in three years, we suggest you do so. If you have recently refreshed your website make sure that you have upgraded it with the latest technology and make sure that all content is up to date. Content is still the king: Map your content to the customer and their journey and make sure that you have a content strategy that covers the spectrum of your customers journey. Focus to deliver the best mobile experience: Make sure that you provide the best mobile experience for your users. 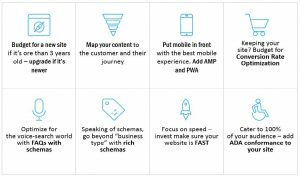 Consider Accelerated Mobile Pages (AMP) and Progressive Web App (PWA) technology to provide needed speed. A secure website (https) is a must have for 2018. Not only is it becoming a ranking factor from Google, users feel more confidence when using secure websites. Make sure that you have a budget to increase your website conversions and work on elements of your site that you need to optimize. Use FAQ’s and Schemas to power your voice search: Be prepared for common user questions and make sure that they come to your site for answers rather than go to a competitor’s sites. Go beyond “business type” with rich schemas and schemas across your entire website. Don’t forget speed: Make sure your website is as fast as possible, not only on mobile but also on desktop. Speed is critical for the entire spectrum of customer journey. Lastly, all customers are important: Cater to 100% of your audience. Often businesses look at ADA conformance from the legal perspective, and forget about the opportunity to provide all of their customers a rewarding experience. With 20% of Americans having some form of a disability, ADA helps you cater to their needs as well. 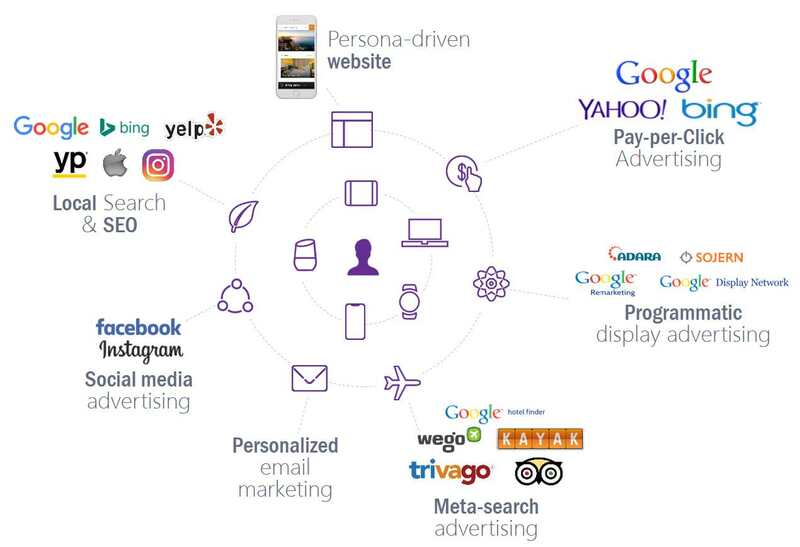 Omni channel strategy begins with very strong and powerful SEO and Local presence. People need to find your information quickly and it must be 100% accurate all the time. That means SEO and Local search are critical to ensuring that customers and potential customers find you online and in real life. Make sure that at the beginning of the year you have a technical digital analysis which covers your platform technology elements. 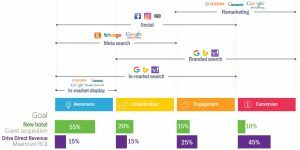 What does your digital presence look like in comparison to your competitive set? Ensure your content is the latest and most accurate. For example, an incorrect address on Google maps means customers can’t find you and that means lost revenue. Make sure your information (URL, Name, Phone, Address) is accurate and consistent in the digital eco-system. Provide content to your customer based on the way that they look for information. Make sure the information is useful, relevant and shareable, whether it’s information regarding upcoming events, amenities at your hotel, or the latest photos from the pool party. From a digital advertising perspective, it’s critical to be everywhere all the time. One of the important aspects for planning your 2018 digital marketing strategy is that you be on all devices all the time. 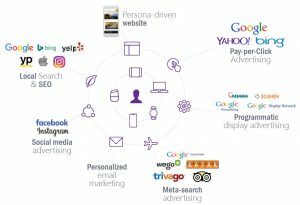 Whether it is meta search advertising, paid search advertising or programmatic or social media advertising, make sure that you reach your customers on all platforms with all the relevant content. By understanding your 2018 business goals, you are ensuring that the budget is not just about assigning some resources towards your digital assets but also understanding how it applies to your media mix. For example, if you care more about guest acquisition, allocate more spend towards the awareness stage. On the other hand, if you wish to drive direct revenue, focus more on the conversion stage. Thus, it’s very important to align your goal to media mix. How much media budget is right? It is different for every business. Ultimately, it comes down to understanding your business needs, what is the desired impact and who your target audience is and different market. It’s also important to monitor your competitors. What are they doing there and how does it impact your business? Use emails to personalize communication and drive engagement, special offers or services. If you are a Milestone customer then you would be able to utilize Milestone Insights to understand how the customer journey is being impacted by the advertising and marketing strategy that you have implemented. For example, you can look at your social media spend and consider new ways to optimize it. Or what about PPC? Should you be spending more or less on PPC? You could answer the question – how do I mix both of these channels to get a better ROI? Being able to analyze your ROI and determine what is working for your business is critical to optimizing your digital marketing budget in 2018. Whether you are doing it through Milestone or utilizing other tools, make sure you are paying attention to the right things. So, what does your 2018 Digital Marketing budget look like? Start with your website and ensure you are delivering a rich experience. Invest in local search and SEO. Invest in both social media advertising and social content marketing. Make sure that you take advantage of both combined. Invest in digital media and PPC based on your goals. Broaden your reach with display advertising, remarketing or meta search advertising. For retailers, think about Google Shopping and Amazon advertising as a great way to get your message in front of your audience. Make sure you include at least one analytics tool. Gaurav Varma brings a solid combination of business savvy and understanding to his writing, but it is his enthusiasm for technology, opportunity, his employer and colleagues, and pure potential that rings with every sentence. As a baby boomer still working in the tech industry, I believe companies that have employees working at the intersection of tech and the customer experience will drive results. I’ve “lived” the work-tech revolution, I started my first tech job in 1986, and am very optimistic about tech’s role in all lines of business and industries. Gaurav knows how to blend the technical elements of work into easily “consumable” content. Well done. An interesting topic to read! Greatly helped me to master few concepts on digital marketing strategy. Longing to read similar posts! It surely increases the awareness about the latest technology which must be used to keep updated in SEO and Digital Marketing. Proper methods and tools used for digital marketing and paid searches could increase ROI. That’s important as new techniques are always being updated. Good insight and knowledge on Planning Digital Marketing Budget. Thank you for sharing this information. It was very helpful.